Environment Canada has issued a heat warning for Montreal and its surroundings, advising people that humidex values are expected to reach at least 40 on Monday. Environment Canada has issued a heat warning for the Montreal area and its surroundings, advising people that humidex values are expected to reach at least 40. The temperature will resemble what Montreal experienced during the week-long heat wave earlier this month that broke records in Quebec. The weather agency said the heat is due to a "warm and humid air mass from the United States" which is tracking into southern Quebec for the day. "Heat warnings are issued when very high temperature or humidity conditions are expected to pose an elevated risk of heat illnesses, such as heat stroke or heat exhaustion," the warning said. It cautioned young children, pregnant women, older adults and people with chronic illnesses to try not to be out in the heat for long periods. The heat and humidity levels also pose health risks to people working or exercising outdoors, the warning notes. 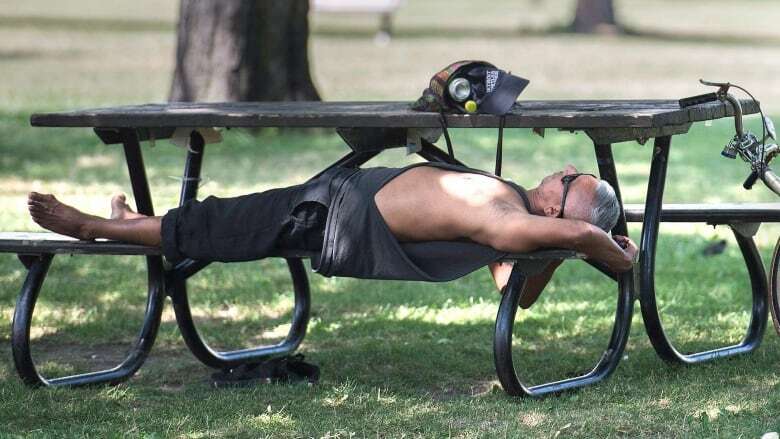 Dr. David Kaiser, who works for Montreal's public health department, said his agency is on alert to watch for any negative health effects the heat may have on the population, but further measures aren't necessary for now. "We don't expect that, with a day or two at this temperature, that we'll really see significant impacts on the population," he told CBC News. Kaiser said the agency would be looking at data from ambulance transports and hospital admissions "to make sure we're not missing something that may be going on." For the moment, though, Kaiser said, health officials are encouraging people to check on their family members and neighbours, especially if they are elderly, have physical or mental health issues or face other problems that could put them at increased risk from the effects of the heat.